There is no one solution that will solve for the disparity in gender representation in corporate India. However, organizations have started to look beyond merely complying with the Maternity Benefit (Amendment) Act and address the real needs of new parents at work especially in terms of tangible support like crèche facilities. To promote female labor force participation and meet the Government of India’s G20 commitment to reduce the gender gap in labor market participation rates by 25 percent by 2025, the Center is encouraging the States to notify and implement crèche rules. Organizations have already started to look beyond compliance to address the real needs of new parents at work and are providing childcare, parenting and maternity support benefits that help in retaining a diverse workforce and creating trust among employees. In light of the recent notifications on crèche rules from states like Maharashtra, Karnataka, Haryana, and Kerala that cover a large share of corporate India, companies are taking cognizance of the crèche provision under the Maternity Benefit (Amendment) Act and acting on it. Tangible support like crèches near offices or homes is now becoming a reality for India Inc.
A recent ProEves survey across 40 organizations reveals that amongst all maternity and paternity support policies provided by employers, crèche support has the highest ROI in terms of greater positive impact and lower implementation challenges for the organizations. Positive impacts associated with crèche benefit are increased maternity engagement and retention, improved trust of employees, and diverse hiring. Roshika Singh, Tackling Childcare & Employment - India Lead, IFC elaborates on it and says that, “The MB Amendment illustrates a genuine effort by the government to remove childcare as a barrier to parents’ and women’s participation in the workforce. Globally, women spend approximately three times the amount of time spent by men on unpaid work that includes childcare, but in India, research reveals that women spend close to ten times more time. Without access to quality childcare support, mothers often choose between their jobs and caring for their child. Providing employer-supported childcare services can boost women’s labor force participation, enhance firms’ performance, and contribute towards economic growth in India.” With state guidelines being notified, companies are increasingly picking up this agenda. Even young, growing organization like OYO with 27 as the average age of employee is investing in childcare. “We are cognizant of our employee needs and the launch of our in-house daycare, Little O, which is a significant step towards ensuring work-life integration for them. Daycare is available to all parents working for OYO and we are seeing more and more children being enrolled every month. In addition, to the facility, there is a reimbursable monthly allowance which can be availed by OYOpreneurs working at different locations across the country” states Dinesh R, CHRO at OYO. The State notifications on crèche rules are clear with respect to the distance of the crèche facility. 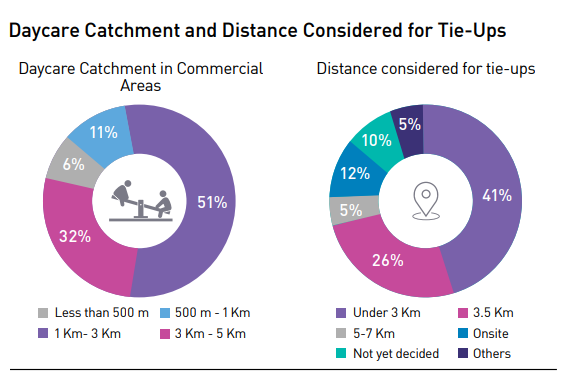 In Maharashtra, the crèche rules specify a distance of under 1 kilometer, while in Haryana and Karnataka, government notifications provide for a distance of up to 500 meters from the place of work. ProEves research (that surveyed 117 companies) reveals that 72 percent companies are considering near-site daycare tie-up, out of which 41 percent are considering distance under 3 km to provide the safest nearest daycare to their employees. ProEves also analyzed the daycare catchment across 100 commercial complexes spanning 7 key cities (including Mumbai (MNMT), Delhi, Pune, Gurgaon, Bangalore, Chennai and Kolkata). The findings reveal that only 17 percent of commercial areas have quality daycares in less than 1 km radius. While the rules on close proximity of the crèche have been established to allow for nursing mothers to visit the facility up to 4 times a day, it is not the preference of parents who have children who are no longer nursing and live in cities where local transport and high real estate costs are issues. Along with investments in paid maternity leave and crèche facilities, leading companies are providing additional support in terms of online resources, coaching, and counseling to expecting and new moms and their line managers to enable the transition into motherhood and return to work smoother for working mothers. Companies like Capgemini, Wipro and Infosys provide access to online learning and resources, maternity apps for expecting and new mothers support them during this transition, along with maternity buddy and mom mentor program. Some of the leading companies are now extending maternity resources to include paternity cases too as new fathers are at equal risk of feeling dissonance on becoming a new parent as they feel they aren’t able to either support enough at home or continue with their focused commitment at work. ProEves insights based on childcare and parenting support show that an equal if not more percentage of working dads want support. 55 percent of working parents stressed about work life balance are men, and more than 80 percent of working mothers want their spouse to become active parenting partners and seek advice on how they can involve them. Companies are providing family-friendly policies like four weeks of family support leave for elderly care or childcare to both genders, in addition to maternity and paternity leaves. There is no one solution that will solve for the disparity in gender representation in corporate India as implementation challenges remain. Companies that have a wait and watch approach towards crèche implementation will soon realize that this is a low cost-high impact benefit. The target segment that will utilize this benefit comprises less than 10 percent of workforce. Providing such a benefit not only increases retention of experienced professionals but also builds empathy and trust in the organization. Coupled with post-maternity and parental support benefits, it creates an equal society that is conducive for both genders. *ProEves Crèche Benefit Research conducted in Dec 2017 surveyed 117 companies making it the largest study on crèche related practices in India. #ProEves Childcare, Maternity and Parental ROI Survey April 2018 surveyed 40 leading companies to understand the impact of these practices. Divya Agarwal is the Co founder of ProEves which provides holistic parental support solutions.